Yes, I enjoy vampire romances! The only vampire books I've read are the Twilight series, which I really enjoyed. I'd like to see another one (or more!) too. I think the best suspense or mystery novels are made even better with the addition of romance or some other twist. The books sounds really good. I love vampire books.I like to see what myths authors come up with for them. Plus their dark and mysterious. 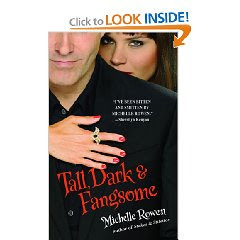 The only other vampire books I've read are the Twilight series - but this one sounds like a fun, easy read too! thanks for the chance to win! I love vampire books, any kind at all. Romance, horror, doesn't matter. Thanks for the great giveaway! I entered the Sleepless Nights giveaway. 2.I entered the Sleepless Nights giveaway. 3.I entered the Sleepless Nights giveaway. 4.I entered the Sleepless Nights giveaway. 5.I entered the Sleepless Nights giveaway.